The next round of La Liga games are coming up this weekend before the international break kicks in. Take a check of the odds and ratings listed above then give us your thoughts on what bets to place! The guests haven't scored any goals so far, but I think that with the defence of the hosts they can break the net at least once. Moreover, Getafe is quite strong at home, it is very possible to take the 3 points in this match but I think that the odds too low for a bet. In the previous game between these teams there have been 4 goals and the odds were again quite low for under 3 goals. In my opinion over 2 goals is the best bet for this game. Little derby here and with such weak defences I really believe that both teams can score at least a goal. Individual mistakes can happen here which can help us. Orellana is back for Eibar and he will be a big plus. In July, there has been a friendly game between these teams and Sociedad managed to win with 3 - 2. I expect again a narrow win with both teams to score. Girona is underdog here but I think that there chances are bigger than the bookies are displaying the odds. I think that they have enough power to score at least once and also the hosts with the fans' help can score at least once. After the 0-0 from the last round against Sevilla, the hosts have to score to make their fans happy. Amazing odds here for a both to score bet. I think that it can be easier than bookies believe because Real Madrid's defence has been struggling in the last matches. In the previous 2 direct matches on Bernabeu, both teams scored and I expect the same thing again. El Zhar & En Nesyri can score at least a goal in this match. Value bet here. Bookies offered to us very balanced odds but I think that the value of the teams is quite big between these two teams. I watched Espanyol's last match against Valencia and they were very strong in the defence. The hosts have some problems in the attack and this fact can be a plus for a confortable win for the guests. There aren't important missings for none of the teams so I will predict a win for Espanyol Barcelona. I am never keen to back an away team in a preview but I get the feeling this could be a good week to back Atletico Madrid to take all three points on their visit to Galicia when they play Celta Vigo at the Abanca-Balaidos in their 5:30pm kick-off this Saturday evening. Celta Vigo raised a few eyebrows during the summer when they parted company with ex-manager Juan Carlos Unzue in favour of Argentine Antonio Mohamed. The bizarre decision was subject to scrutiny because Mohamed had never managed outside of Argentina or Mexico before this appointment. Still, it's been a decent start for Mohamed with 4 points from 2 matches. Atletico Madrid haven't had an ideal start but it could have been worse. Due to their involvement in the UEFA Super Cup, Diego Simeone was forced to call his World Cup players back to training earlier than preferred. This is perhaps a reason for their below par performances so far. Atletico did still win the Super Cup and are unbeaten in the league but it's been far from convincing. This is a fixture that does not hold the best of memories for Celta over recent meetings. The Celticos have failed to even score against Atleti in their last four meetings on home turf. However, they have not lost at home in La Liga since the beginning of 2018 which is quite an achievement. I just think that after a full week of rest, Simeone will have a squad that is a lot better prepared than it has been during the hectic start to the season. 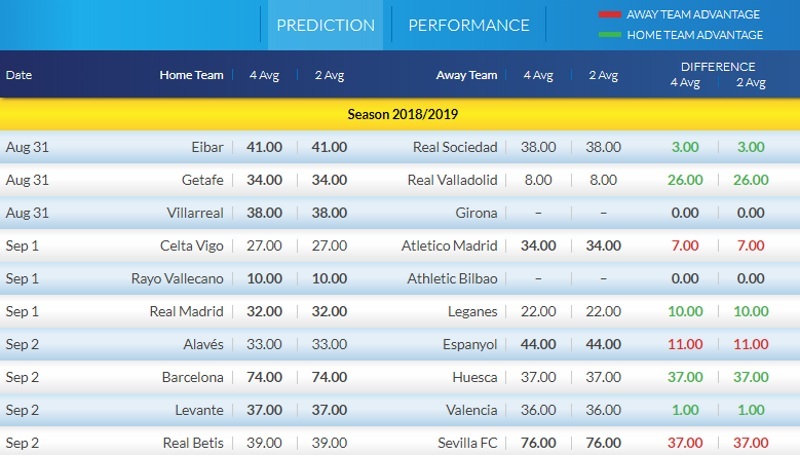 There is no doubt they remain firm title contenders this season and if they are to live up to that tag then they need to get wins at places like Celta. I think it'll be close but they should sneak a win. @Pep004, @Magic0024, @betcatalog, @malabgd, @AndreBR, @Xcout, @four-leaf, @sajtion, @Arkadi Manucharov, @Jamesboaz, @RealUnited, @allyhibs, @jazzman02, @Mr.Paul, @notanotherdonkey, @Marek76, @freestylerx, and @derbent, what tips do you all have for us this week? Real Madrid scored in last 5 games in La Liga. Leganes has over 2.5 goals in their last 3 games in La Liga. Real Madrid scored in last 11 home games in La Liga. Leganes scored in last 4 games in La Liga. Real Madrid scored over 1.5 goals in last 9 home games in La Liga. A little loss this round but that is the betting life. I'll post new tips when La Liga will be back on 14th September.